Simone delivered this presentation at the Second J Street National Conference in 2011. Good afternoon. You’ve heard the other panelists discuss the merits of BDS and whether it’s effective. I recognize that BDS seeks to address serious human rights issues in Israel and the Territories. However, at UC Berkeley, rather than creating discussion, it was my experience that our BDS campaign created a polarizing atmosphere where both sides sank further into the extremes of their positions. I felt that it fostered animosity, squashed nuance, and alienated the rational voices most essential to addressing these complex issues. It also exposed significant weaknesses in the organized Jewish community. In March, the student Senate proposed a bill calling on the UC to divest from United Technologies and General Electric, two American companies that made weapons the Israeli Army used during Operation Cast Lead. Research revealed that the student government did not even have direct investments in those two companies. Thus, the campaign was mainly symbolic. After a 16-4 vote in favor of the bill, our student body president vetoed it, claiming the matter was too complex and divisive. Then the fight to override the veto began, and problems on each side intensified. Senate meetings were excruciating. Lasting for hours until the early morning, each side made their cases. But the truth is, no one was really listening. There was more theater than debate. It was a competition to be louder, more provocative. On one side of the room people were shouting about human rights, alleged Apartheid, their experiences with racism and horror stories from Gaza. The other side of the room shouted about anti-Semitism, exclusion and division on campus, victimization of Israel, the morality of the army, Hamas, Gilad Shalit. The two sides of the room were having completely different conversations. While supporters of the bill claimed to be creating dialogue on campus, anyone who didn’t agree was labeled as racist and supportive of human rights violations. Though I was sympathetic to an attempt to address specific issues in Gaza raised by a student initiative, I could see the obvious influence of the global movement in the background. Amidst cheers of “From the river, to the sea, Palestine will be free,” I didn’t trust the good faith of the people promoting the bill to support not only their own causes but also to care about the well being of Israel. During this time on campus there were some anti-Semitic and Islamophobic outbursts, and though I do not believe criticizing Israel is inherently anti-Semitic, the religious and racial tensions created on both sides were damaging, scary, and sad to see. That said, there are many, including Jews, who care deeply about Israel but still supported the bill. This support grew not out of hatred of Israel, but out of deep frustration with the Occupation. I felt completely alienated by the harsh rhetoric of people supporting the bill, and at the same time was agitated by the language and strategy of my peers. I was also frustrated by the shortcomings in our education as products of the American Jewish Establishment. It made no sense to respond to real human rights issues with the narrative of Jewish victimhood. Throughout world history we have been David, but to the Palestinians, we are now Goliath. The truth was, our Israel advocacy fact sheets were not going to cut it anymore. Intentional or not, in defending Israel, we were dismissing and justifying the legitimate suffering of Palestinians. But doing so felt so at odds with what I always thought it meant to be Jewish- I had always been raised to stand with those who suffer, and despite my feelings towards the bill, the suffering of Palestinians in Gaza was and is undeniable. The polarity became so stark that everything you believed could be distilled down to a simple sticker. Either you were a student, activist, queer, feminist, Jew, Muslim, Christian, or human being in support of human rights, wearing a bright green sticker, or you wore a blue sticker, as one who stood with Israel. In the back of the room was a group of students with powerful voices unable to make them heard. They were Jewish social justice activists, moved by humanist and progressive values, some anti-war, some anti-occupation, all socially conscious, concerned with the problems in Gaza as well as the emotion and fear tied to the anti-divestment movement on campus. They didn’t identify fully with either side. No green stickers, no blue stickers. Some goals of the bill spoke to their progressive values. 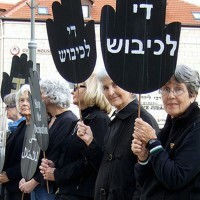 However, their commitment to Israel made some of them mistrustful of the movement before them. The polarity created by both sides was alienating not just for these students, with whom I have quickly come to identify, but also for students who lacked a serious connection to the issues. Simply for being in the middle, or less invested, students felt unwelcome in the hostile environment, and some even lost friends, people on both sides expecting their solidarity alliance and forcing upon them and ugly and upsetting binary. Was BDS at Berkeley productive? Was it a diversion? In a way, it clarified the work we need to do. But the cost was high. It made actually doing that work far more difficult. The BDS campaign on campus raised issues we couldn’t ignore. Yet it strengthened the extremes, encouraging the proponents of a zero-sum game, a win-lose situation, who saw no humanity in the other side. It made no room for real compromise, understanding, or sensitivity to the true pain and suffering of the other. It failed to create a safe space in which to have open, transformative conversations. Personally, it left a deep mark on me. It strained many of my relationships, but I am far more aware of and committed to resolving the human rights issues of Palestinians, creating peace between the two people, and transforming the conversation in the Jewish community. On the whole, though, it didn’t generate engagement. It generated exhaustion. Students in the middle remain in a BDS hangover, while the two extremes are more zealous in their causes. This is the irony of BDS. It raises the issues, but destroys the constituency needed to address them. Simone Zimmerman attends the University of California, Berkeley, majoring in Middle Eastern Studies and currently serves as the national president of JStreet U. Simone has traveled several times to Israel, already a Hebrew speaker, she is now studying Arabic.